It's been a long time coming, but I've finally got around to actually having a finished finish! 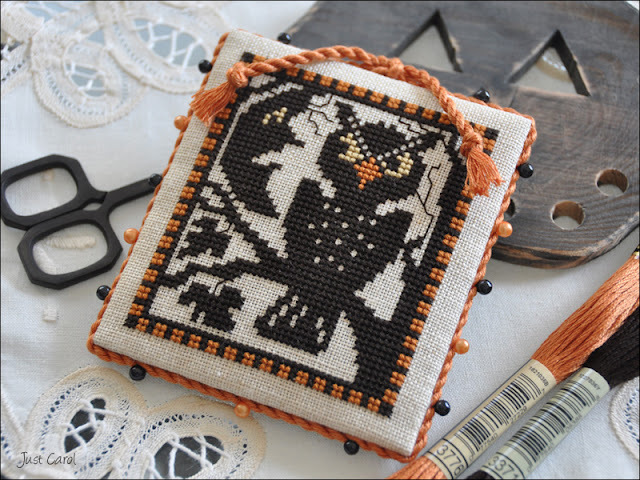 I wasn't going to blog about this one just yet, as I have a couple of other Halloween pieces stitched, and was going to wait until they were also finish finished and then show them altogether. I'm so excited to have at last got around to making something though that I just couldn't wait to blog about it...lol! This is The Prairie Schooler Night Owl from the Just Cross Stitch Halloween issue 2008. Late for Halloween I know, but at least in plenty of time for Halloween this year...lol. This one has been hanging around for so long waiting to be made up. I made a start on the border back in 2008 and then didn't complete the stitching until a couple of years ago. I eventually decided to make it into a pinkeep last year hoping to have it finished in time for Halloween, which didn't happen because I didn't have enough of the DMC 3776 to make the twisted cord and didn't know where I could buy some here in Dubai. Last week I made the cord, and yesterday finally stitched it to the pinkeep. After all this time I can't remember which 32ct fabric I've stitched it on, but I do know that I use the listed DMC threads. 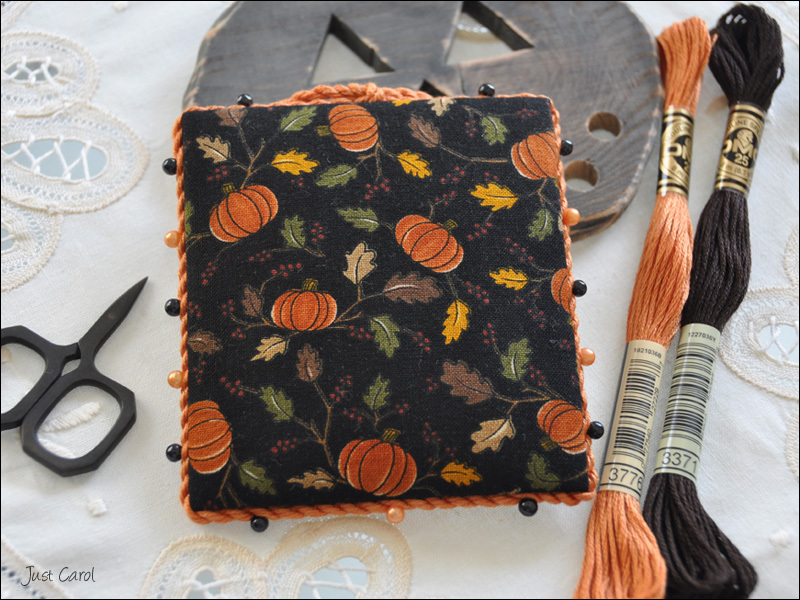 I love the backing fabric, it's a piece I've had for a long time and have used before on my Prairie Schooler Autumn Pinkeep. Happy New Year to anyone who may still be following me, and to any new followers too! I haven't finished any stitching, but I do have a quick little crafty project I can show you. I came across this idea for a wedding invitation ornament on a blog just over a year ago, and thought it was absolutely gorgeous and a wonderful idea for a keepsake. With Jase and Nic only having just had their December wedding (pictures here) I would have loved to have made one for them straight away, but with Christmas looming, and having to prepare for our move to Dubai, I really just didn't have the time. Also, all the clear baubles I could find on the internet were sold out, so I wouldn't have been able to anyway. 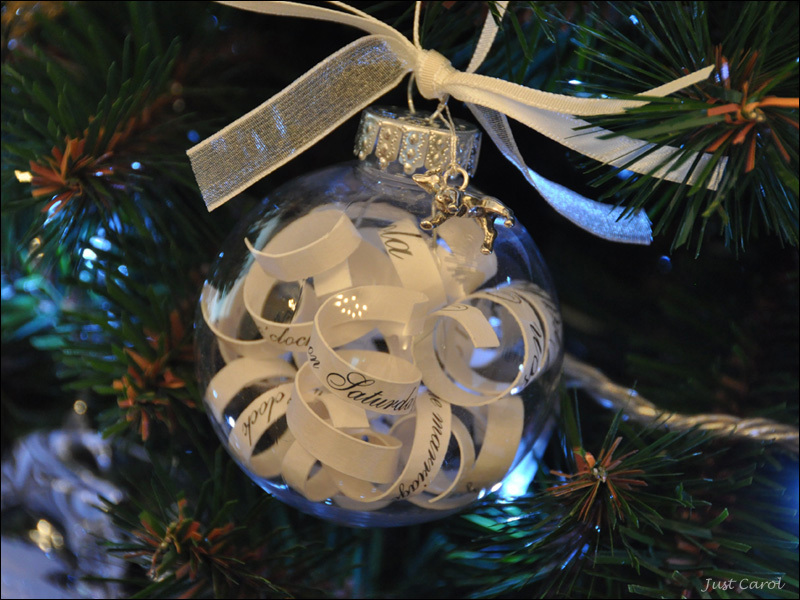 Throughout the year I've been keeping an eye out for when the baubles became available again, and eventually found some during the summer, so was able to make the ornament in time to give to Jase and Nic for Christmas. Inside the bauble is Jase and Nic's wedding invitation, with the key details cut into quarter inch strips. Chota, their little Jack Russell played her part at the wedding too, so I've attached a stirling silver Jack Russell charm. It was so easy to do, and I was absolutely thrilled with how it turned out. When I get the opportunity I will definitely be using this idea again. You can find the simple steps to follow here on Christy's blog. It's been a busy few months for me, with yet again not a lot of stitching getting done, but I've been having a lovely time. 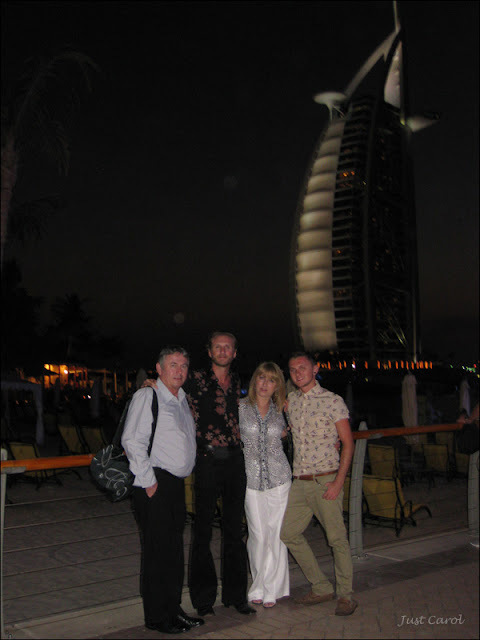 Towards the end of October and the beginning of November, Jason, Matthew and Nic came out to visit us in Dubai. 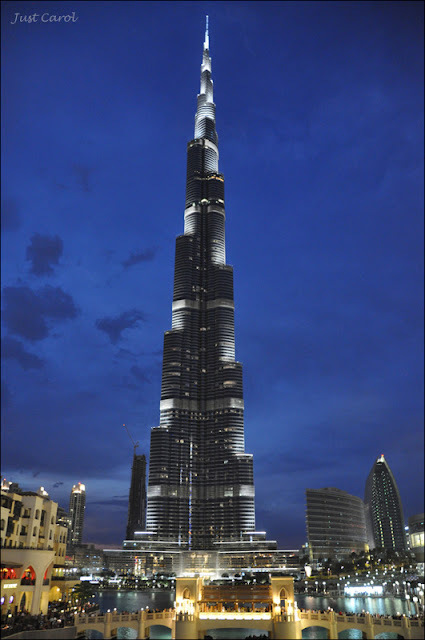 We had a brilliant time - sightseeing, cocktails at the Burj Al Arab, and going up the Burj Khalifa, currently the tallest building in the world, then staying until the evening for a meal while watching the Dubai Fountain show. It was so lovely having them here with us, and we missed them terribly when they left to go back home! I love this photo that Jason took of the Burj Khalifa in the evening before the fountain show. Jason, Nic and Matthew at the Souk Madinat, after a fantastic Friday afternoon Brunch at the Al Qasr Hotel, Madinat, Jumeirah. Colin, Jason, myself and Matthew before cocktails at the Burj Al Arab. Soon after they left I became very ill, only just recovering in time to make my own flight back home to UK on the 1st December, so that I could start preparing for Christmas. Colin followed me home on the 18th for our first Christmas together in three years. Jason, Nic, Matthew and Chota came home for Christmas this year too. 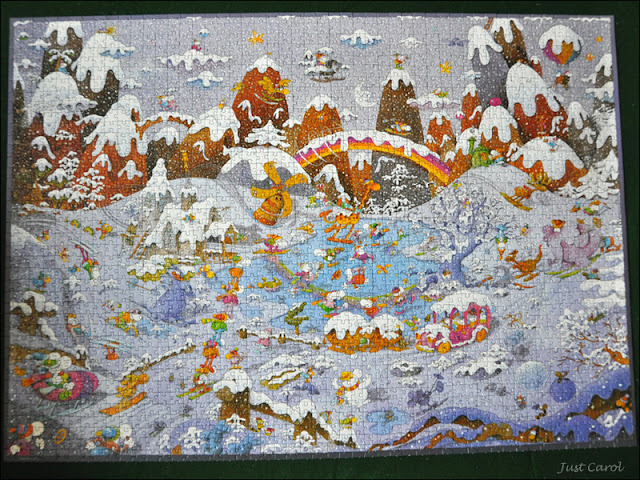 We had yet another brilliant time, and even found time to carry out our family Christmas tradition of doing a puzzle together. This was a 2000 piece puzzle, not the biggest we've done, we've done one with 3000 pieces before, but this one was a little challenging with a lot of white and pale blue. And now here I am! I arrived back in Dubai on the 7th, and can't believe that by the end of the month I will have been out here with Colin for a year! I'm hoping this year to get plenty of stitching and finishing done. I know I've said it before, but I really must! I have all my lovely stash here with me, so no excuse not to really. So here's hoping to be blogging again soon!